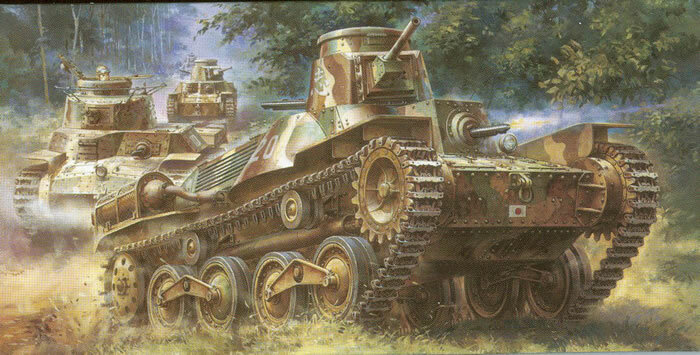 Japanese tank design, like many others, started with examples of the Renault FT from WWI and advanced from there. Their first efforts, the Type 89 Medium and Type 92 Tankette, paralleled Western designs. In 1935 they designed a new three-man light tank armed with a 37mm cannon and two 7,7mm machine guns. Weighting at about 8 metric tons, the little tank underwent four years of testing before entering full production in 1939. But the Japanese did not understand or take into account the results of tank combat with the Soviets in 1938-1939 at the Khasmin Lakes or Khalkin Gol. As a result, they wound up with tanks with inferior armor and armament to their main enemy in the Pacific, the United States. For many years Fine Molds has “owned” WWII Japanese armored and softskin vehicles, but they have had a Type 95 kit on the market for a number of years now. Their kit was nicely accurate but relatively simple and a “quick build”, so this second foray by DML into new territory with a highly detailed version of the little tank is quite noteworthy. Translation: if you are looking for a weekend project, this isn’t it! The suspension comes with four brass spacers/washers per road wheel pair and a slide molded center ring for each pair of wheels, so they are quite involved. The suspension is very petite but complete, and happily DML has provided a set of DS Plastic tracks rather than single link ones for this kit. The tracks are about the size of 1/72 Sherman tracks as a comparison so this is a good idea. Four finishing options are offered: 1st Tank Regiment, Malaya 1941 (four-color camouflage, character, white 20); Kwantung Army, Manchuria 1944 (four-color camouflage, character, white 101); 2nd Company, 7th Tank Regiment, Philippines 1942 (four-color camouflage, insignia, white 9502); 13th Tank Regiment, China (four-color camouflage, character). A small sheet of Cartograf decals is provided. Overall, this looks to be a nice new version of this little tank but will require some concentration on the part of the modeler to assemble.